Manmarziyaan may not be perfect but it gets some things perfectly right. I left the theatre in appreciation of the sheer craft on display. This is a film where virtually every technical department seamlessly delivers, enabling and empowering Kashyap to have made what may well be his most popular film since Gangs of Wasseypur.It’s also his big ‘f**k you’ to every naysayer who dismissed his work as inaccessible and ‘not commercial’. I’m going with three-and-a-half out of five. Anurag, Hindi cinema’s high priest of darkness, turns his ferocious gaze on relationships. But the scenes become repetitive and drawn-out. For years, I’ve exited Anurag’s films raging with frustration and wondering why he inevitably becomes indulgent. Manmarizyaan is no different. He’s so damn talented but he doesn’t know when to stop.Like love, this film is messy and flawed and glorious. You have to sign up for all of it. I’m going with three and a half stars. Anurag Kashyap’s direction is excellent. He has remained true to the story and script and has enhanced them with his narrative style. On the whole, Manmarziyaan is an all-out entertainer with hit music and lovely performances. It will score very well at the box-office. Ladies and family audiences, besides youth, will patronise the film. A couple of the songs are good too, perfectly matching the tone of the movie, but finally there are too many of them. Which is what one can say about the film. You want to shake these lovers and ask them to make up their mind, quick. You enjoy the initial exhilaration born out of breathless passion as the winsome boy and girl engage in the age-old dance of desire. And then they become exhausting. As does the film. Be that as it may, Manmarziyaan is a film that is likely to sweep you along as it goes down its lazy, loopy path in search of happiness for its endearing heroine. You will her on to settle down, but on her own terms. 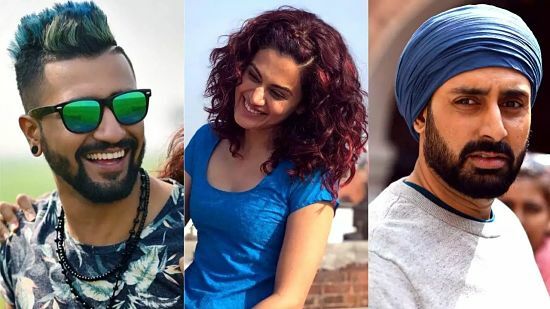 Yet you leave Manmarziyaan with the feeling that neither of the two men in her orbit deserve her.Manmarziyaan, laced with humour and warmth, is a love story with flashes – only flashes, not a sustained flow – of inspiration. On the whole, MANMARZIYAAN comes across as a contemporary and an unorthodox tale laced with some brilliant performances and powerful writing. The bold theme of the film might restrict its appeal but its target audience is sure to give the film a thumbs up. For the eternal die-hard romantics, Manmarziyaan is that tale which encourages you to dream on, no matter what. Go for it with that special someone. ‘Manmarziyaan’ delivers the angst, the duality of characters, and muddled minds of the tinder generation that many new-age films failed to bring to the fore at times. It is a fulfilling love story that is crafted with care and is a must watch. Rumi (Taapsee Pannu)a free-spirited, vivacious young woman and Vicky (Vicky Kaushal), a young man waiting for his music break are in love and they can’t stay out of the bedroom. When they’re caught red handed by Rumi’s family, pressure builds up to get married. But Vicky has cold feet and keeps avoiding Rumi’s request to bring his parents over and ask her hand in marriage. Eventually, she gives up on him and agrees to an arranged marriage. That’s when Robbie (Abhishek Bachchan), a businessman enters the proverbial love triangle. What happens next, forms the crux of the story.